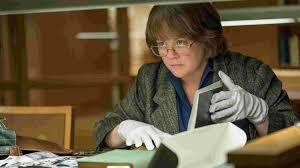 Melissa McCarthy’s extraordinary performance as Lee Israel, the literary swindler and forger, is inspired, complete and unforgettable. Her portrayal of the Hollywood biographer turned criminal in Can You Ever Forgive Me? is touched with genius. She’s not sympathetic and she certainly doesn’t become sympathetic, but McCarthy’s touching hardass earns our attention as a wounded person with no idea how to reign herself in. McCarthy proves her incredible range once again, this time carrying Israel’s deadpan misery of being a “horrible ***t” as she is described, bravely, as if it wasn’t a burden and manages a single non sarcastic smile in two hours. Israel’s a second rate Hollywood biographer who loses her steady job at The New Yorker because she’s rude. Driven by a runaway train of a personality and a vivid imagination, Israel does what she knows best to save herself from living on the streets. Her style of celebrity biography is no longer viable, so she turns to crime, fobbing off forged letters from famous people for big payoffs, providing them with character, precise impersonation and convincing signatures. McCarthy looks completely different, dull, washed out with a permanent angry curl of the lip, and a cold stare that shows pure disdain for all. It’s through her eyes that she delivers the goods. This is McCarthy’s tour de force, in a drama no less. Sure there are some other people in the film, like Richard E Grant who plays a roué and her only friend, and he provides a strong second banana to her indomitable Queen of Mean. McCarthy plays Israel as not just the alpha male in any room but as a victim unable to save herself from herself. EDITOR’S NOTE: CAN YOU EVER FORGIVE ME? is AWFJ’s Movie of the Week for October 19, 2018.